Election season is just around the corner as well for current office holders and office hopefuls seeking most of the statewide positions that will be on the ballot for the nearing May 21, 2019 primary election. One candidate who is hoping to upset the apple cart so to speak, Robert Goforth, brought his campaign for the Kentucky Republican nomination for Governor to Albany last week to meet with local business and party leaders, and spend some time meeting Clinton County voters. Goforth, a pharmacist from East Bernstadt, Kentucky in Laurel County, is running for the Republican nomination against Kentucky’s current sitting Governor, Matt Bevin. Goforth currently is a Kentucky State Representative for the 89th District in eastern Kentucky and his running mate is Mike Hogan, an attorney from Lawrence County. During his visit last Thursday to Clinton County, the Republican hopeful made a brief visit to the Clinton County News office to talk about his campaign, his stance on several issues as well as his background and why he decided to challenge Bevin in the upcoming primary election. “I was raised in coal country poverty by a single mother who raised me and my three brothers and we never knew if we were going to have a roof over our heads or not, but she did the best that she could,” he said, noting that he dropped out of high school at age 16, and later joined the Army, earned his GED and became a combat engineer. Suffering a back injury while working for Tecumseh in Pulaski County, he was told he would need to change the direction in his life as his injury would prevent him from working in a manufacturing environment in the future. Goforth said he took the advice of that physician to enroll at UK and begin working toward achieving that goal and when he had earned his Doctorate of Pharmacy degree, he returned back to his home area and opened his first pharmacy in Pulaski County, eventually opening three more, one in Clay, McCreary and Jackson counties. The candidate noted that he would be able to lean on that experience as a business owner to help lure firms to Kentucky. “I know how to build a business, I know how to talk to people, I know how to negotiate with CEOs and help lure businesses to Kentucky,” he said. Goforth also said he sees the need to focus on the growing drug abuse problems in Kentucky and also talked about his background in substance abuse teaching programs that in the past he said had included classes in Clinton County schools. He elaborated that he had plans for programs that would do more than just make people feel good for a while, something he said that Bevin’s earlier “painted rock” program only did. He also touched on Kentucky’s secondary education process currently, noting that he would promote method changes in that area as well. “We have to teach some of the life skills that will help them succeed in life and not just teach them a test and how to score well to get through some numbers to make people feel good. We have to make sure that we take every child into consideration and teach that child,” he said. On the issue of gun control, his stance is one of guaranteeing that Kentuckians have their second amendment rights defended and protected, and have the right to protect themselves at all times while in the Commonwealth of Kentucky. The Goforth-Hogan ticket appearing on the upcoming Republican primary ballot, will be one of four pairs of hopeful pairings voters will have a choice of. Incumbent Governor Matt Bevin is running for his second term hoping to win the party’s nomination with his new running mate, Kentucky State Senator Ralph Alvarado. Two other pairs of candidates are also seeking the Republican nomination, including Ike Lawrence, of Lexington, with running mate James Anthony Rose, and William Woods, of Boone County, with running mate Justin Miller. 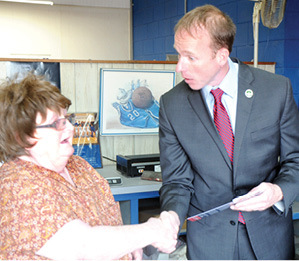 Republican Kentucky Governor candidate Dr. Robert Goforth took advantage of a chance last week to introduce himself to potential voter Darlene Cummings of Albany in the lobby area of the Clinton County News office.